Koda Quest asks kids to perform eco friendly activities in their daily life. Many parents I know have expressed their concerns about letting their kids spend too much time playing apps and games on the iPad. One way to solve this problem is by limiting their screen time. But, I’m sure many parents would love to learn if someone came up with a good (and innovative) solution for this. Fortunately, Fingerprint Network recently released an app called Koda Quest. 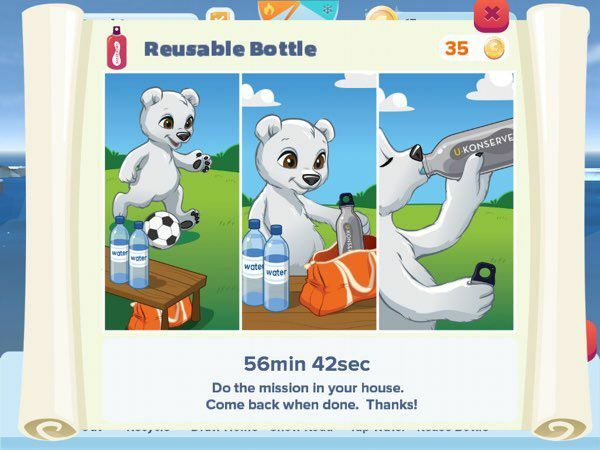 Starring Koda the Polar Bear, kids are given real world missions to save energy and recycle their trash in order to save Koda’s icy home that is melting from the global warming. Playing Koda Quest feels like taking care of a digital pet. You let him run around the iceberg, dance to the music, or juggle the small fishes he catches. When the iceberg gets large enough, you can even watch him play with the slides or do a cartwheel. When the iceberg gets smaller due to the climate change, you can help Koda by playing the eco-friendly mini games. The first game asks you to fish out the floating garbage on the beach, whereas the second game lets you slice the dark carbon clouds (but be careful not to slice the innocent birds). Each time you complete a mini game, you will be rewarded with in-app coins. You can then use the coins to buy meals to feed Koda or brushes to clean the polar bear. You start the game at Level 1, and move your way up the ladder by completing the in-app tasks and real-world missions. For example, to move up to Level 2, you need to feed Koda with some sushi and turn off any extra lights at your home. Because each level includes a real-world mission, you can’t move forward just by completing the in-app tasks alone. To see what the tasks are, tap the checklist icon on the top of the screen. Some tasks may require you to buy new outfits or new lamp stands to help Koda get some sleep. If you ever find yourself running out of coins, just remember that you can play the mini games again to collect more coins. Based on the amount of text instructions in this game, Koda Quest is more suitable for kids ages 5+ who are comfortable with reading short sentences on their own. The game itself is a free download, and it doesn’t include any ads or in-app purchase. However, it will encourage your kids to show the app to you and ask for your email. If you decide to give your email address, Koda Quest will send you emails on how well your kids are progressing through the app. You can also see and verify whether your kids are actually performing the real world missions as instructed by the app. Koda Quest is designed by Cool the Earth, a non-profit organization with an optimistic approach to addressing climate change through small, simple actions to reduce energy and water use. The real-world missions really show this eco-friendly theme. A sample email that Koda Quest sends to me as a registered parent. These real-world actions have cool-down periods between five minutes to four hours. During these cool-down periods, you can’t complete the action. You must wait until the cool-down period ends before you can mark the action as completed. This subtly forces you to either perform the action or stop playing for a while. Koda Quest is also the first app I’ve seen that asks kids to show the app to their parents. Combined with the parent’s emails, it promotes playing as a parent-child activity. 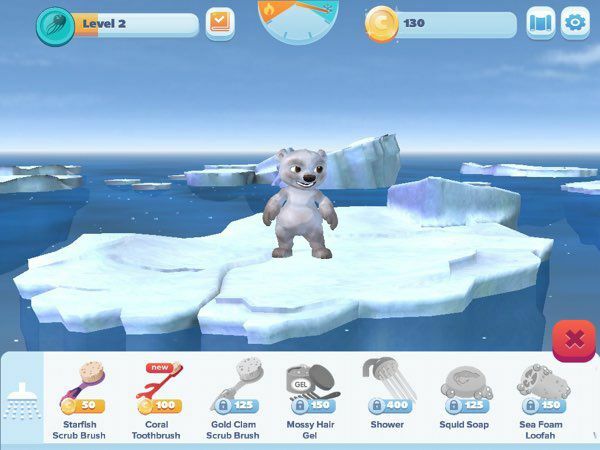 To level up, you’re asked to feed, clean, and play with Koda the polar bear on top of his tiny iceberg. 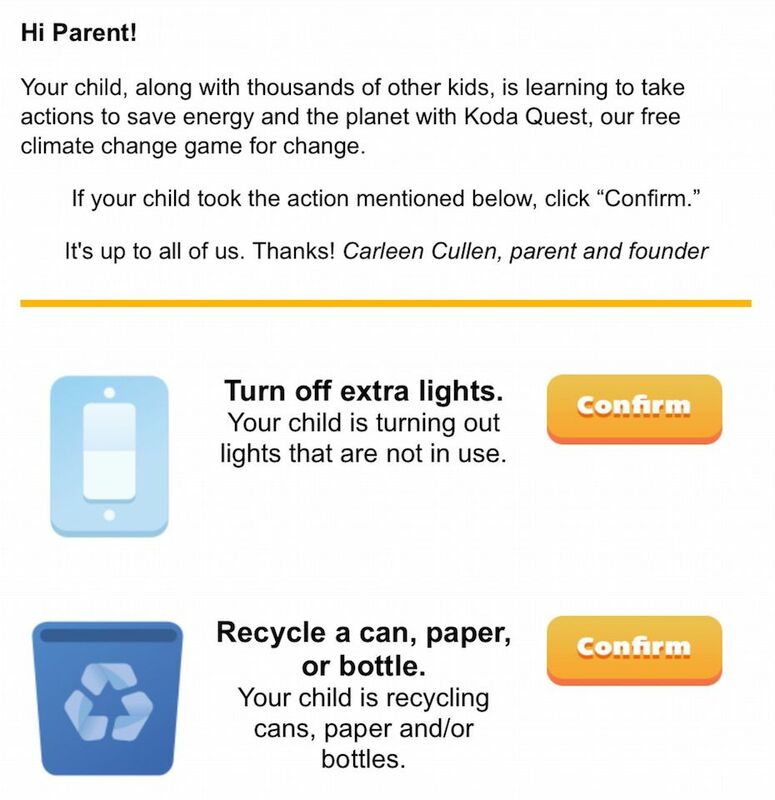 Koda Quest is a unique app that encourages kids ages 5+ to perform real-world eco-friendly activities in their daily lives. The app also encourages parents’ participation in verifying whether their kids are performing the activities or not. If you’ve been wondering how to instill green habits in your kids, Koda Quest is the perfect app to start.